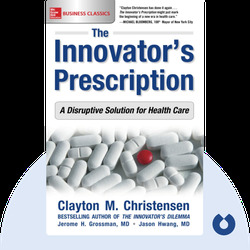 The Innovator's Prescription by Clayton Christensen, Jerome H.
The Innovator’s Prescription (2008) is a guide to applying business concepts to the field of health care and, in the process, revolutionizing the industry and making it more affordable and accessible. These blinks explain how health care has become mired in its old ways and how disrupting stagnant business models can make the field run like new. 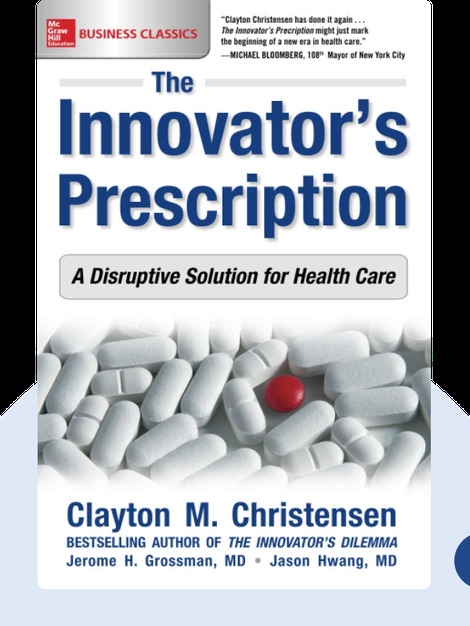 Clayton M. Christensen is a professor at the Harvard Business School and author of several New York Times bestsellers, including The Innovator's Dilemma. In 2011, Thinkers50 named him the world's most influential business thinker. The late Jerome H. Grossman, M.D. was an expert in health care policy and a pioneer in health informatics. He served as director for the Harvard/Kennedy School Health Care Delivery Policy Program. Jason Hwang, M.D., is an internal medicine physician turned entrepreneur. His prior work includes co-founding and serving as executive director for Innosight Institute, a consulting firm specializing in innovation and strategy.